Switzerland 2012. DCP 16:9, colour, 97 min. Of all the mountain films I have made, the film ‹My First Mountain› marks the conclusion of my cinematic reflections on rural and Alpine Switzerland. I grew up at the gateway to Central Switzerland with a view of Mt. Rigi. Since my childhood, the sweeping backdrop of this mountain has never ceased to impress me. In 1480 Albrecht von Bonstetten, Dean of the Abbey of Einsiedeln, had defined Mt. Rigi as the centre of the world. In my film ‹My First Mountain› I try to explore this centre as a witness of our time. Mt. Rigi is also the first mountain for the Alpine herdsman Märtel Schindler. Just like his ancestors, he grew up on it and lives and works on this mountain, a popular tourist and recreation destination. In this film I attempt to probe the heart, the heart of a magnificent landscape and the heart of a personal account, to capture an image of time from the heart of Switzerland. Erich Langjahr may be widely regarded as the personification of mountain films. He has been part of Leipzig since the 1970s, caused a sensation with his Alpine trilogy, enchanted everyone with his «Erbe der Bergler» – and has now announced that he is going to present his last (or so he says) mountain film. It’s dedicated to the Rigi: a summit once described as the centre of the world, which is still partly true for many people in Switzerland. How do you describe a mountain? Erich Langjahr’s method: stay away from all folklore, be poetic and therefore concrete. 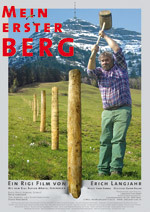 Once more he unites precision and soul as he observes a native of the Rigi region felling trees, cutting posts, pouring concrete or shovelling snow, sharing a meal with friends, driving cattle up and down the mountain and walking over the mountain. This appropriation is never contemplative – and here’s another constant in Langjahr’s philosophy -, but always active. Langjahr’s camera, which was once fascinated by haymaking on the mountain, is now immersing itself in the ballet of a mini-excavator or the virtuosity of a chainsaw. The Rigi is no refuge of the pre-modern age: there’s mass tourism here as well as futuristic viewing platforms, high rises and the inevitable «Rigi Events». And yet this film – maybe helped by the transcendent and jazzy alpenhorn soundtrack – is a hymn to what is sacred to us (even in a secularised world) – and to Switzerland, this strange and distant planet. The view of and from Mount Rigi stays with people for a lifetime. This massive, mighty mountain on the Lake of Lucerne has impressed and attracted swarms of friends of nature, artists and tourists alike, since time immemorial. 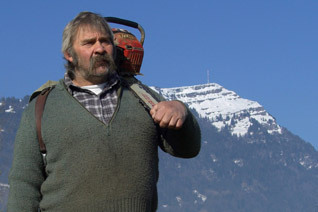 For alpine farmer, Märtel Schindler, the Rigi is also his «Queen of the Mountains». Like earlier generations of his family, he works on and has been shaped by the mountain. 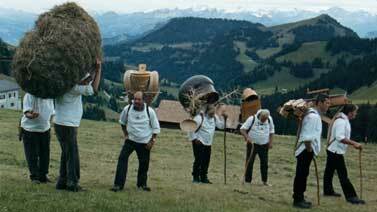 Filmmaker Erich Langjahr has made a name for himself as a chronicler of rural alpine Switzerland. 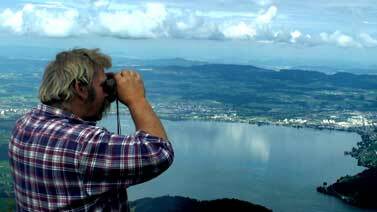 He too was raised with a view of Rigi at the gateway to Central Switzerland, and in his film portrays those who live with and live off the mountain.